Kalamera 96 Bottle Stainless Steel Beverage Cooler. This “Scratch & Dent” product is in very good working condition. Each unit is a fully functional return item with moderate to severe scratches/dents on one or more panels. The product has been tested for quality assurance and is certified “Fully Operational”. Built-in or freestanding installation. Digital LED temperature control. Blue interior LED light. 6 sliding metal shelves. Cooling temperature range: 38-50°F. Input voltage: 110 V/60 Hz. Rated current: 1.5A. Weight: 72.8 lbs. Dimension(without handle): W14.9 x H33.9 x D22.4. Dimension(with handle): W14.9 x H33.9 x D24.2. Suggested built-in dimension: W15.3 x H34.1 x D22.4. Before plugging in your beverage refrigerator, allow it to sit upright for at least 24 hours. After 24 hours, plug in refrigerator, and allow interior to reach optimal temperature. After 24 additional hours, fill with bottles, allowing space between bottles or cans. Allow refrigerator time to adjust to reach set temperature. For optimal function, do not obstruct interior fan or exterior kick plate. With quality compressor unit and outstanding compressor vibration reduction gear, Kalamera Beverage Refrigerator offers evenly cooled space for your wine bottles with minimized vibration. You can also enjoy the quietness with your guest sitting by the cooler. LCD temperature display enables you to tune the temp to your favorite degree between 38-50°F. The thermal meter brings with itself a function to restore your cooler back to the set temperature from a power lost, which can protect your cold beverage from the increasing temp in case you forget the lower the temp. The built-in universal hexagon bolt lock guarding your refrigerator so only you can manage your cooler storage space, preventing kids playing with your beverage or frequent opening with temperature changing and affect your cold drink. The embedded carbon filter can help purify the air again odors inside the cooler and gives a good reservation condition for your bottles. It is strongly suggested to place the refrigerator out of direct sun shine. 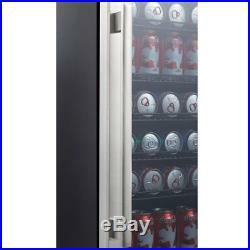 The double pane glass door prevent the cold air lost because of the UV which could protect your favorite drink crispy! We know you’re really going to love this idea! 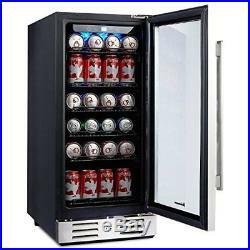 Our Kalamera beverage refrigerator can be used in any room of your home, from the kitchen to the man cave! It can be installed under a counter in the kitchen or bar/entertainment area; or, use it free-standing in any room. The compressor is whisper-quiet, maintaining even temperature longer without constant stops and starts, so it wont interrupt that romantic movie on Date Night! It has a sophisticated design, all stainless steel, with a transparent glass double-layer door. Inner soft blue LED lighting showcases your canned beverages, and friends and family can help themselves without digging through frozen slush to see where their favorite beer is hiding! It also have a temperature memory function, will restore the set temperature in the cooler after it is back on from power lost, which keeps your wine collection from going bad with increasing temperature. This unit takes up under 22.4×14.9 of floor space, so whether you have a mansion or a downsized condo, it will easily fitand will actually save you storage space by fitting all your canned beverages inside! 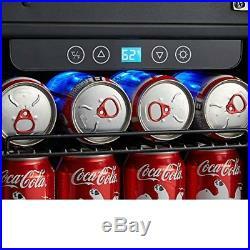 Removable racks make filling the cooler easy and fast, and in minutes you’re back to the game! Compare to U-line, edgestar, whynter. The item “Kalamera 96 Bottle-Stainless Steel Undercounter Beverage Cooler Smart LED Lights” is in sale since Friday, September 01, 2017. 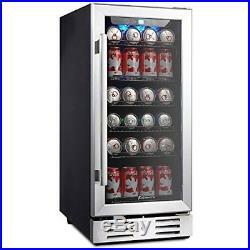 This item is in the category “Home & Garden\Major Appliances\Refrigerators & Freezers\Mini Fridges”. The seller is “ginge.da” and is located in Salisbury, North Carolina. This item can be shipped to United States.